A decoy draws an early morning attack. 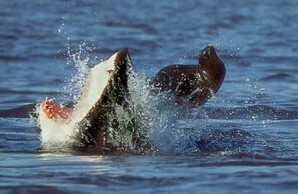 A Cape fur seal’s rear flippers are clamped in the jaws of a white shark. The sharks rush their quarry from directly below; the power of the attack often hurtles both predator and prey out of the water. Fool me once . . . . Another shark falls for the decoy. After one or two strikes, however, most get wise to the ruse. 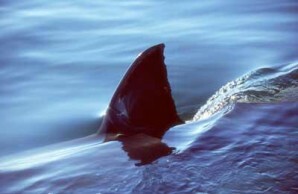 A white shark’s dorsal fin breaks the surface. 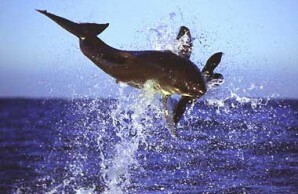 Attacking a decoy, a white shark spins tail-over-head. 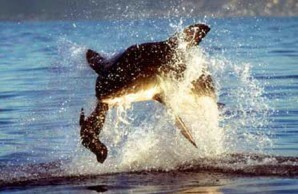 A Cape fur seal pup leaps nimbly out of harm’s way, just as a white shark breaks the surface in attack. It's twenty past seven on a winter morning. Our research vessel drifts off Seal Island, South Africa. A lone Cape fur seal pup porpoises through the gently rolling swells toward the island. Suddenly, a ton of white shark launches from the water like a Polaris missile, the little seal clamped between its teeth. Framed against purple clouds washed with the orange light of breaking dawn, the shark clears the surface by an astonishing six feet. 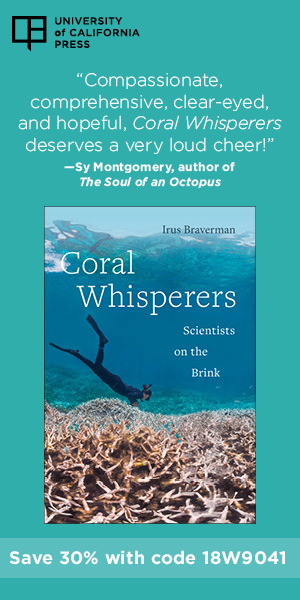 It hangs, silhouetted in the chill air for what seems an impossibly long time before it falls back into the sea, splashing thunderous spray beneath a gathering mob of seabirds. We and our crew of five student volunteers watch breathlessly as the drama unfolds. Now mortally wounded and lying on its side at the surface, the seal raises its head and weakly wags its left foreflipper. The shark, an eleven-and-a-half-foot male we call Sneaky, circles back unhurriedly and seizes the hapless pup again. He carries it underwater, shaking his head violently from side to side, an action that maximizes the cutting efficiency of his saw-edged teeth. An ominous blush stains the water and the oily, coppery smell of the wounded seal prickles our nostrils. The seal carcass floats to the surface while gulls and other seabirds compete vigorously for its entrails, squawking avian obscenities at one another. Sneaky returns to his meal, and another white shark rises from below—a thirteen-foot male we call Couz. For white sharks (also known as great whites), socializing trumps dining. Sneaky turns his attention to Couz. Is he friend or foe? Of higher or lower rank? For half a minute, Sneaky and Couz swim side by side, warily sizing each other up as white sharks do when they meet. All of a sudden, Sneaky hunches his back and lowers his pectoral fins in response to the threat posed by the larger shark, whereupon he and Couz veer apart. As we record their interactions, a female sweeps in and usurps the remains of Sneaky’s abandoned meal. Then calm returns to the sea. Just six minutes have passed since the seal pup was innocently making its way to shore. Watching such ferocious predatory assaults and intense socializing is a shark biologist’s dream. 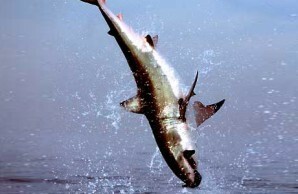 In fact, despite the white shark’s reputation as the animal kingdom’s überpredator, surprisingly little is known about the basics of its foraging behavior: its hunting tactics, its feeding cycle, its preferences in prey. Its migration routes and favorite hunting grounds, aside from the waters around Seal Island and several other places, remain largely unknown. 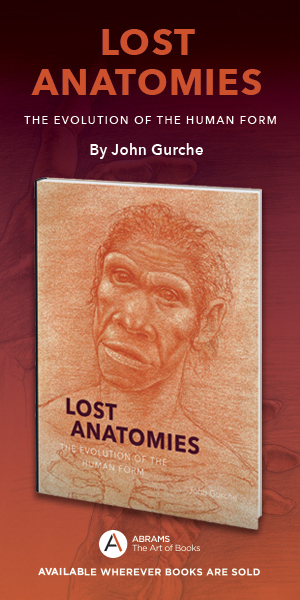 And even less is known about its social behavior. Most people—at least since the movie Jaws—assume the creatures are solitary, stupid, antisocial brutes. But after observing the white sharks at Seal Island for eight seasons, and documenting more than 2,500 predatory attacks, we have arrived at quite a different opinion. Our research demonstrates that white sharks are intelligent, curious, oddly skittish creatures, whose social interactions and foraging behavior are more complex and sophisticated than anyone had imagined. Nowhere is that social and foraging behavior on more vivid display than at Seal Island, a rocky, five-acre islet in False Bay, twenty-two miles south of Cape Town. The island is home to some 64,000 Cape fur seals, plus thousands of cormorants, gulls, penguins, and other seabirds. Mother fur seals give birth here in the spring, around the end of December. By early May the pups are joining their older siblings on fishing trips into False Bay and beyond. 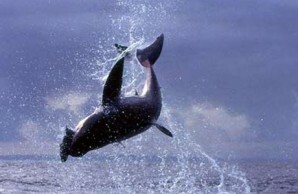 That’s when the white sharks start showing up—from parts unknown—to hunt the young-of-the-year pups. Chris Fallows and Rob Lawrence, South African naturalists based in Simon’s Town on False Bay, discovered the site’s attractions in 1995, when they observed the sharks’ vigorous seasonal predatory activity and their remarkable aerial hunting style. (Both behaviors can be observed elsewhere, but far less frequently than at Seal Island.) At Fallows and Lawrence’s invitation, we visited Seal Island in 2000 to see for ourselves. Since then we have returned each southern winter to continue studying the remarkable behavior of the white shark. In the popular imagination, Carcharodon carcharias is the quintessential predator. The largest of all predatory sharks, it reaches a length of more than twenty feet and a weight of 4,500 pounds. The white shark possesses acute color vision, the largest scent-detecting organs of any shark, and sensitive electroreceptors that give it access to environmental cues beyond human experience.